The school has active collaboration partners with several technology and education service providers to infuse freshness into the student offering and expand the opportunities available to them. Fortis Healthcare Limited is a leading integrated healthcare delivery service provider in Mohali. It is a globally respected healthcare organisation known for Clinical Excellence and Distinctive Patient Care. As part of its CSR, the Hospital got into partnership with ‘Learning Paths School’ to run its medical room and offers quick service, at a rebate, at the main hospital in case of any emergency, including OPD and hospitalisation services. Junior Achievement (JA) India is a not-for-profit organization dedicated to educating students about workforce readiness. It works with industry to provide students with perspectives and insights to help them make informed career choices and open their minds to their potential. With the School starting +1 Commerce section from April, 2016, students will get an exposure to principles about Work Readiness, Financial Literacy and Entrepreneurship, through experiential, hands-on programs. CII is a non-government, not-for-profit, industry-led and industry-managed organization, playing a proactive role in India’s development process. A few years ago, CII started the ‘Young Indians’ programme, known as Yi, to encourage youngsters to play a pro-active role in the country’s development. ‘Learning Paths School’ is a very active member of Yi with at least 300 students as active members who take up social service activities over the span of the year. All programmes are designed specifically to work in Indian context. They can operate in limited spaces and actively engage large class sizes. The scientifically designed, structured EduSports programmes help physical education & sports get to the same level of rigor, focus and stakeholder involvement that exists in academic subjects in schools. At ‘Learning Paths School’ the programme runs from Pre-Nursery to Class II. Macmillan is not only a publishing house with a reputation of bringing out books that keep pace with the changing trends of the world. It is at the forefront of innovation, supporting the transition of the traditional Indian classroom into one with blended learning environment–print, digital, and online products. Macmillan is also known for working closely with teachers to understand the issues of concern in their professional lives and offer all possible support to address those concerns. Learning Paths School’ has introduced Macmillan books and theories of education to give to the students the best available in the current market. Founded by Daniel Berdichevsky the first World Scholar’s Cup took place in Korea in 2007. The idea behind the World Scholar’s Cup was to create something different than traditional academic competitions and conferences: a celebration of the joy of learning, a tournament as rewarding for the team that came in last as the for the team that came in first, an enrichment opportunity that motivated students not just to demonstrate their existing strengths but to discover new ones. The students of Learning Paths School have participated at Regional Levels at Athens and also at the final rounds at Yale University, USA. This is a not-for-profit organisation engaged in generating interest among students towards computer science, science, technology, engineering and mathematics (CS-STEM) through the innovative use of Robotics learning platform and other research based hands-on learning tools. We at ‘Learning Paths School’ believe that Robotics based programs & competitions are one of the best platforms providing an opportunity to students to connect with science & technology in a fun filled and engaging manner. The School runs both a Stem Club and a Robotics Club and has reached the National Level in various competitions sponsored by STEM. Opens a window to other countries and cultures, giving teachers and pupils a new outlook on the world. Prepares pupils with skills for life and work in a global economy, opening their eyes to new opportunities. Gives the school a fresh and attractive identity, and a new globally conscious ethos. It is a leadership challenge and fosters team building, innovation, and project management. 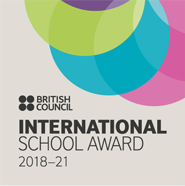 ‘Learning Paths School’ has been awarded the ISA twice, from 2012 to 2015 (as The Millennium School, Mohali), from 2015 to 2018 and recently for 2018-2021.